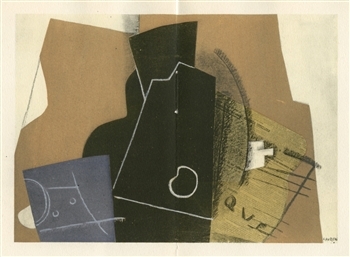 Henri Laurens pochoir "Instruments de musique"
Medium: pochoir (after the watercolor and collage). Printed in Paris by the atelier of Daniel Jacomet, and published in 1955 by Heinz Berggruen for a rare catalogue. The image measures 5 3/8 x 7 1/2 inches (135 x 190 mm); there is a different Henri Laurens composition printed on the back. Signed in the plate, not hand-signed. Condition: this was issued as a folded sheet with a center crease and stitch holes from the publisher's binding.